On Thursday night, April 24, I had the privilege of participating in the Green Sheep Webinar for the Interfaith Power & Light chapter in my region (DC, MD, NoVA). The theme of the webinar was “Speaking Out, Faithfully,” and — consistent with our Year of Jewish Policy Engagement on the Environment — the focus was on raising our voices together as people of faith to make a difference in environmental advocacy. One of the lovely things about being on an interfaith webinar is getting to interact with a group of people with shared values and different perspectives. I felt honored to be able to participate and share about my efforts in the Jewish community, while also having the sense of coming together with a much wider group. 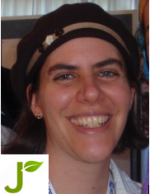 Joelle Novey, director of our chapter of Interfaith Power & Light, explained it well: when we all come together to make a difference, we start to feel like the kind of difference we can make may just be on a big enough scale to address today’s huge sustainability challenges. My presentation included details about the Year of Jewish Policy Engagement on the Environment, and my process of realizing that learning and action – while important – are not enough. We have to claim our power as citizens, and use our democracy, or we will lose it to other interests who are more than willing to take it away from us. I also shared my own experience of working as a faith-based leader in my local community, and participating in the Interfaith Power & Light campaign for offshore wind power in Maryland. That experience helped me to understand the difference that a small group of committed activists can make in state politics. The session began with a reflection from Shantha Ready-Alonso from St. Camilllus Catholic Church in Silver Spring, MD. Shantha pointed out that so many of us find it uncomfortable to engage with environmental advocacy because our society has become so polarized politically that it’s rare we ever have the chance to speak respectfully and meaningfully with people who disagree with us. I have heard this often from lay leaders in faith communities. But Shantha pointed out a positive perspective: that our faith communities are sometimes the only place left where we can have conversations with people of differing political views, and still feel a sense of community. This ability to have dialogue is truly key to successful democracy and is one of the reasons that engaging the faith community to address environmental sustainability is so important. The session continued with Jose Aguto, of the Friends Committee on National Legislation. He made a compelling argument for the value of continuing to engage Congress on the topic of climate change. He said that so many organizations have given up on Congress that they don’t often even hear about addressing climate change from their constituents, getting the unfortunate message that people don’t care about this topic. As Jose expressed, we can’t let our resignation prevent us from meaningful democracy! It’s certain that our Congressional legislators are hearing from people who don’t want to address climate change, both with their voices and their dollars. And as the faith community we have a special voice to add, because our message is distinctive, and because legislators don’t expect to hear this concern from us. I hope that over time, the Jewish community can become more involved in this type of meaningful advocacy work with others who share our commitments in the faith community. When we all come together, we can have a big voice! Featured Causes: Support Canfei Nesharim! Nice! Sounds inspiring! I didn’t know that organizations have given up on Congress. That doesn’t sound good. I think efforts need to be stepped up, if anything. I think there needs to be marketing and advertising in favor of sustainable energy to counter all the propaganda for non-sustainable energy. Thanks for sharing this information. I believe that faith voices have an important role to play in advocacy efforts on the environment. We are not the “usual suspects” (e.g. The Sierra Club or 350.org) and we offer a unique perspective as to why we believe saving the Earth is a priority. Check out this new posting about our Silver Spring Sustainability Circle!